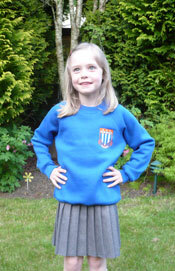 Dunvant Primary School Sweatshirt. Kid's raglan sleeve sweatshirt. Twin needle coverseams on neck, raglan sleeve, cuffs and waistband for extra durability; herringbone back neck tape; Sportshield stain resistant coating for fabric protection; fade resistant. Fabric: 50% Combed Ringspun Cotton 50% Polyester. Sizes available: 3/4 Years to 11/12 Years.